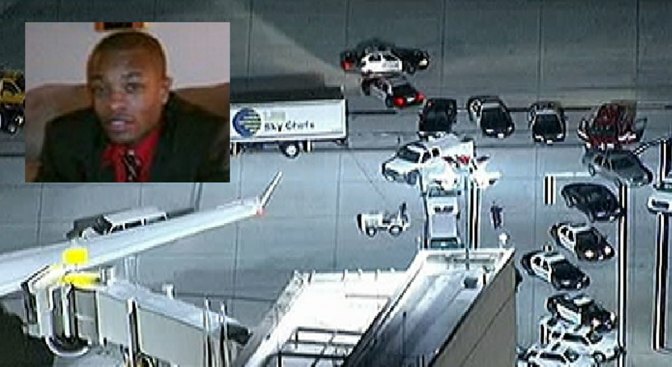 LAPD says suspect had no specific motive, wanted to "experience a device exploding"
A former baggage handler at Los Angeles International Airport accused of setting off dry ice explosions at the airport allegedly did so out of "curiosity," investigators said Wednesday. Dicarlo Bennett, 28, was arrested Tuesday on suspicion of exploding a destructive device near an aircraft and possession of a destructive device in a public area, authorities said. At a 3:30 p.m. news conference Wednesday, investigators said they ruled out terrorism, connection to a criminal group or “a specific intent to hurt someone” as a motive. LAPD investigators have ruled terrorism as the motive behind a series of dry ice bombs left at LAX, two of which exploded. Police are looking into the possibility a disgruntled employee may be behind the bombs because they were found in restricted areas that were off-limits to passengers. 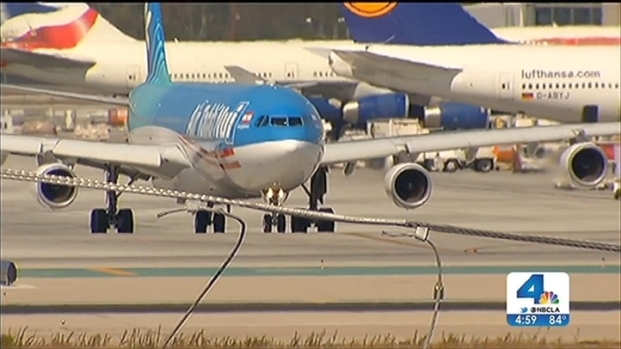 Patrick Healy reports from LAX for the NBC4 News at 5 p.m. on Tuesday, October 15, 2013. Instead, they said the explosions were a dangerous prank. “It was basically perpetrated out of a desire to construct and experience a device exploding, said Lt. John Karle, LAPD Officer in Charge of Criminal Conspiracy Section Division. Jamaican-born Bennett allegedly took dry ice from a plane – where it is used to cool food and drinks served in flight – and placed it in an employee restroom Sunday night, airport police said. Another device was found on a tarmac outside the international terminal. Dicarlo Bennett, a 28-year-old Servisair baggage handler from Paramount, Calif., was arrested on suspicion of exploding a destructive device near an aircraft. The arrest comes after authorities discovered dry ice bombs in an employee restroom and on the tarmac at LAX. Toni Guinyard reports for Today in LA on Wednesday Oct. 16, 2013. No one was injured in either incident, though people were in the restroom when the first explosion went off, officials said Wednesday. An employee saw a separate plastic bottle expanding outside the Tom Bradley International terminal near gate 148. Three dry ice bombs were found on the tarmac outside of Los Angeles International Airport Monday night, prompting a bomb squad response as the FBI probed an explosion by the same type of bomb at LAX just one night earlier. As a result of the incident, dry ice will no longer be disposed of at the airport, said Chief Patrick Gannon, with Airport Police of Los Angeles World Airports. Instead, after flights, the dry ice will be returned to the warehouse or service stations from which it came. The suspect worked as a baggage handler for Servisair and was arrested at his home in Paramount, Calif., about 15 miles east of the airport. Bennett was among the nearly 50,000 badge-carrying airport employees who underwent a background check to land the job, Gannon said. He is being held on $1 million bail. “He was very cooperative and he obviously knew the wrongfulness of his actions," Karle said. As for the suspect's state of mind when he allegedly planted the explosives, Karle said he was unsure. "I think we can all conclude that, most likely, you had somebody here who was just acting negligently without any intent to harm or injure somebody but it would certainly be described as gross negligence or irresponsibility," Karle said. Still, authorities were adamant during Wednesday's new conference that someone could have been seriously hurt by the simple devices made of a plastic bottle and dry ice. "This is as serious as a pipe bome filled with shrapnel," said Deputy Chief Michael Downing, with LAPD's Counter-Terrorism and Special Operations Bureau. "It's a destructive device. It can do harm and death, if in the right circumstance, so we took it very seriously."